About: MooseFS is a fault tolerant, high available, highly performing, scale-out, network distributed file system. It spreads data over several physical commodity servers, which are visible to the user as one resource. Current release. Doxygen doesn't incorporate all member files but just a definable subset (basically the main project source code files that are written in a supported language). So to search and browse all member files you may visit the Fossies moosefs-3.0.104-1.tar.gz contents page and use the Fossies standard member browsing features (also with source code highlighting and additionally with optional code folding). MooseFS is a Petabyte Open Source Network Distributed File System. It is easy to deploy and maintain, fault tolerant, highly performing, easily scalable, POSIX compliant. MooseFS Linux Client uses FUSE. MooseFS macOS Client uses FUSE for macOS. There is a separate MooseFS Client for Microsoft Windows available, built on top of Dokany. moosefs-client MooseFS Client - client side package to mount the filesystem. Feel free to download the source code from our GitHub code repository! Building MooseFS on Linux can be easily done by running ./linux_build.sh. Similarly, use ./freebsd_build.sh in order to build MooseFS on FreeBSD and respectively ./macosx_build.sh on macOS. Remember, that these scripts do not install binaries (i.e. do not run make install) at the end. Run this command manually. It is recommended to use XFS as an underlying filesystem for disks designated to store chunks. Repeat steps above for second (third, ...) Chunkserver. There are more configuration parameters available but most of them may stay with defaults. We do our best to keep MooseFS easy to deploy and maintain. MooseFS, for testing purposes, can even be installed on a single machine! Refer to installation guides for more details. Copyright (c) 2008-2019 Jakub Kruszona-Zawadzki, Core Technology Sp. z o.o. This file is part of MooseFS. 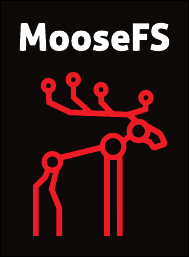 MooseFS is free software; you can redistribute it and/or modify it under the terms of the GNU General Public License as published by the Free Software Foundation, version 2 (only). You should have received a copy of the GNU General Public License along with MooseFS; if not, write to the Free Software Foundation, Inc., 51 Franklin St, Fifth Floor, Boston, MA 02111-1301, USA or visit http://www.gnu.org/licenses/gpl-2.0.html.